The Best Pacifier Collection For Unique Baby Shower Gifts! Looking For The Best Pacifier Collection? 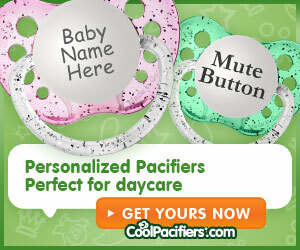 The Best Pacifier For Baby ... looking for unique personalized pacifiers? Choose from whimsical designer and holiday designs ... to personalized pacifiers and mustache designs too. Say Hello To The Personalized Pacifier! Discover why CoolPacifiers offers the hottest baby products for unique baby shower gifts and find out which celebrities are using them. Cool Pacifiers are made of non-toxic, hygienically formed, natural bite-resistant materials designed to form naturally in baby's mouth, satisfying the need for supplemental sucking and providing parents with peace of mind. How Did CoolPacifiers Become So Popular? Because of the "Cool People" who first used them! baby using The Cool Pacifiers Personalized Pacifiers and read how Angelina and Brad started it all rolling in 2006. 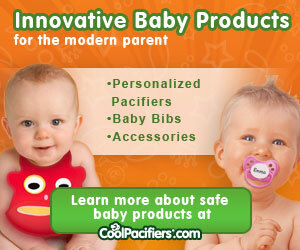 See CoolPacifiers Awesome Reviews and Find Out Why They Make The Best Pacifier! Made of Non-Toxic, hygienically formed, bite resistant materials, these pacifiers form naturally in Baby's mouth and satisfy the need for additional sucking. These best pacifier are of the highest quality, German made and Personalized Pacifiers are becoming the hottest trend. Choose Baby's name or choose a nickname (we all had them, remember? ;) ) for a personalized pacifier. non-toxic and innovative baby products available. Are you making a unique baby shower gift? Add a personalized pacifier, or two to your homemade gift. Whether it's a "bag of goodies", or just attaching a pacifier with a pacifier holder, to a hand knitted, or crocheted blanket. What a great personal touch to Creative Baby Shower Gifts. Making a Baby Shower Diaper Cake? Personalized pacifiers are perfect to include on the diaper cake along with all the other supplies that Mom-To-Be needs. Or maybe you just want to put together some great nursery supplies from our Baby Nursery Ideas. A pacifier will be a welcome sight to Mom (or Dad) at 3 o'clock in the morning. So, add one or two to your gifts ... you can never have enough pacifiers!